Over the longer term, buying your system up front at fair market value is generally less expensive than all of the large company "specials" heavily advertised in the media as "free systems". We practice no deceptive pricing practices like this, and give all of our customers absolute maximum value for their dollar. Non-monitored option Virtually never available except at drastically inflated prices Not recommended and not provided due to the severe degradation of overall security. See "monitoring"
System takeover of monitoring from another company (we do not actively encourage this except coming from the mass marketers) Can vary from $50 to $300 by large firms. Others usually no charge. No charge, provided it meets acceptable standards upon inspection. Note: Older hardware, or "oddball" panels may require a hardware upgrade to a new, modern panel plus keypad at wholesale cost. Warranty term Varies from 3 months to 1 year Indefinite while monitored including backup batteries and lightning strike. *False alarm payout: Some companies will pick up false alarm charges. We obviously use the same discretion in applying this policy applying it to installations done by our firm (no takeovers), and will refund if the equipment is clearly at fault. Under our free service concept, questionable equipment (in your judgment) brought to our attention is replaced immediately (hopefully before it causes problems). Note: Police visits are $130in the event of a police visit on a false alarm. However, third party response companies charge $45 per visit for every dispatch whether real or false, and this is available to all customers at their choosing by advising the monitoring station. If investigation of the alarm call proves real, police will then be called and will always respond. 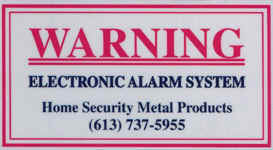 We actively encourage customers negotiate their own contract with the third party alarm response company - usually at $45 per visit - and save the billing surcharge added by the monitoring station. This page last updated Saturday, February 25, 2012 .